Is Liberty Global stalking Vodafone? 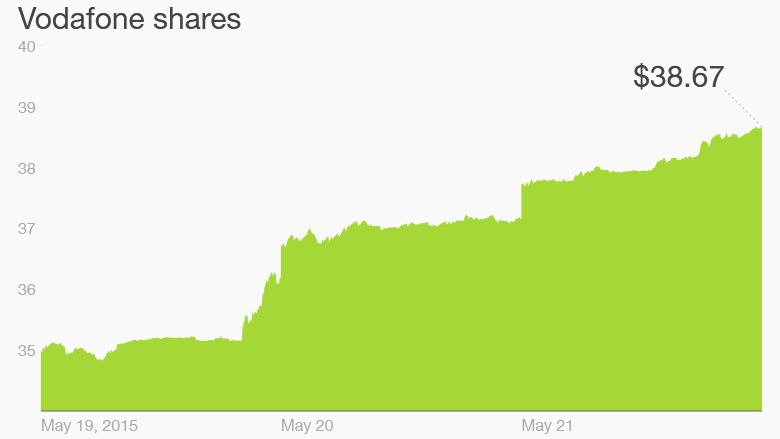 Vodafone shares have surged this week based on takeover talk. Shares in British telecoms group Vodafone have surged by roughly 11% in London in the past three days as investors get excited by takeover talk. Media mogul John Malone told Bloomberg earlier this week a tie-up between Vodafone (VOD) and his cable company, Liberty Global, would be a "great fit." Neither company would comment on the speculation but analysts said a merger could work. Vodafone shares gained 4.9% on Friday, taking the stock to a 14-year high and helping London's FTSE100 index to outperform other European indexes. "A potentially integrated Vodafone-Liberty Global could be well placed to leverage investments and drive higher growth and returns," Barclays analysts said in a research note. They said the deal could lead to $20 billion of potential synergies. Vodafone is the world's second largest provider of mobile phone services. The U.K.-based company operates in 26 countries and has 444 million customers.